Carson LT-10 LinenTest Magnifier is a compact, fold-out Lighted LinenTest magnifier featuring a 15mm lens. Dual lens design ensures a clear, distortion-free view. Super bright LED light illuminates your subject. Make fine focus adjustments by twisting the focus wheel. 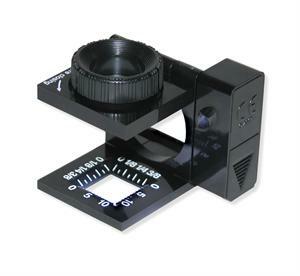 The LT-10 Lighted LinenTest Magnifier contains markings in both inches and centimeters for easy measuring of small parts and is perfect for stitch counting. This magnifier is portable, lightweight and folds flat for storing when not in use. The LT-10 Lighted LinenTest Magnifier comes complete with a hard plastic case for safe storage. 11.5x Magnification. Dimensions 1 1/2" x 1 1/2" x 3/4"